Auto accidents have life-altering consequences. When you are catastrophically injured in a serious accident, you deserve to hold the responsible party accountable and to get the compensation you need and to which you are entitled. Ira M. Maurer has more than three decades of experience handling accident cases. He will fight tirelessly for compensation on your behalf. For a free case evaluation, please call The Maurer Law Firm at 845-896-5295. If you were injured in a motor vehicle accident, you want our law firm on your side. With more than 30 years of trial experience, Mr. Maurer has won over a thousand significant verdicts and settlements for his clients. Some of the cases Mr. Maurer has tried in court are cited by lawyers and judges as precedent when making decisions in similar litigation matters. He is proud of his record, but he is most proud of the relationships he builds with clients who have nowhere else to turn when the deck is stacked against them. Auto insurance coverage often only covers the basics and doesn't go far enough to compensate you for your total financial and social damages. Careless drivers can cause catastrophic auto accidents. Some of the most common causes of accidents are distracted driving, texting, drunk driving and numerous other things. When someone else's negligece is the root cause of your accident, you should not have to deal with the life-altering consequences of your injury without proper compensation. When you want to maxmimize your insurance settlement or compensation award, you need to choose a lawyer who will serve as your aggressive adovocate. Many lawyers and other professionals demand respect. Ira Maurer believes a good attorney must earn your trust. 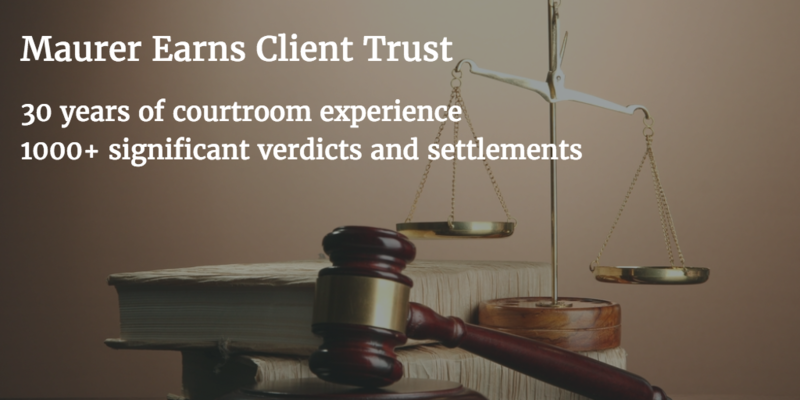 Many of his clients come to our law firm by referral from other attorneys or past clients. Some clients call Mr. Maurer for help after getting frustrated with the progress of their case. The fact is, there are complex insurance issues that you need to understand, and Mr. Maurer takes the time to make sure you know what is going on. An informed and educated client will make the right decision when it is time to consider your options. If you or a loved one were seriously injured in an auto accident caused by someone else's negligence in Fishkill, Myers Corner, Beacon, LaGrangeville and nearby areas of Hudson Valley or elsewhere in New York, please contact The Maurer Law Firm by calling 845-896-5295 to schedule a free consultation with experienced accident attorney Ira Maurer.